A secret, cynical reason Paul Ryan can’t give conservatives what they want on Trumpcare. 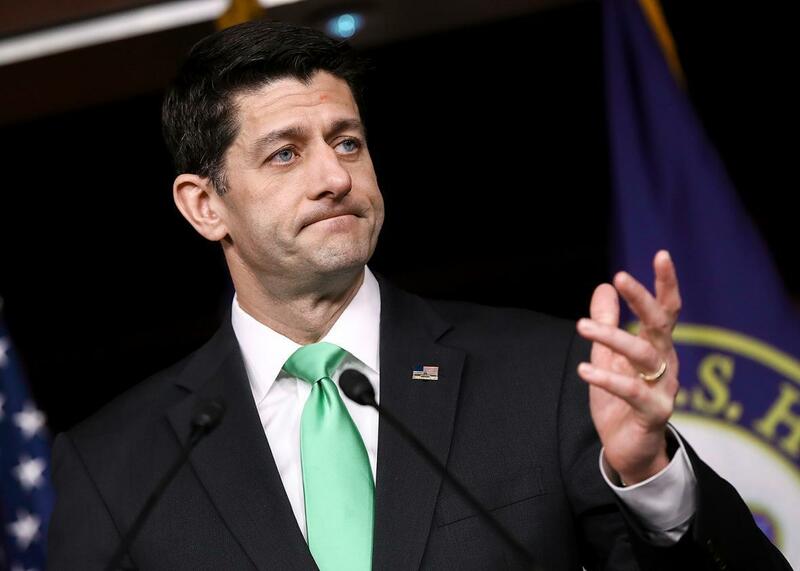 There’s a secret, cynical reason Paul Ryan can’t give conservatives what they want on the American Health Care Act. Speaker of the House Paul Ryan answers questions about the American Health Care Act at the U.S. Capitol on Thursday. You cannot fault House conservative holdouts for a lack of clarity in their refusal to support the American Health Care Act. Each one I spoke with on Tuesday made the same point: If policy provisions were added to the bill deregulating health insurance markets—especially repealing the Obamacare requirement that qualifying insurance plans cover 10 essential health benefits—they would not just vote for it but do so enthusiastically. They would think it was even a good bill—gasp!—and House leaders could unlock roughly 20 to 25 votes to put them over the top for passage while also presenting something resembling an ideologically coherent vision of health policy. These conservatives have made this point repeatedly to the press, to Republican whips, to White House aides, and to the president himself. The stated reason leaders have not given into this is that Senate rules would not allow for such provisions. The Byrd Rule only allows reconciliation bills—ones that require a bare majority for passage—to include provisions directly affecting the budget, and not regulatory reform. The Senate has advised House Republicans that eliminating the essential health benefit requirements would not pass muster, and so that is apparently that. Leaders plan, instead, for Health and Human Services Secretary Tom Price to use his discretion through the rule-writing process to water down these requirements. As some conservatives point out, though, even if the rule writing passes legal muster—an open question—the next time the White House goes Democratic, those rules could be reversed again. It’s not an ideal long-term solution for conservatives to leave these regulations on the books. You’d think, with conservatives putting so much weight on this, that House leaders could simply tell Senate Republicans to figure out a damn way to do it. During the repeal “test run” in 2015, for example, the parliamentarian told Republicans that they couldn’t strike the individual mandate through reconciliation. So they came up with the solution to bring the individual mandate tax penalty down to zero. Couldn’t some sort of policy retrofitting like that be done with the essential benefits, too? Republicans could also make a more forceful case with the Senate parliamentarian that these benefits affect government spending, since they … do. The regulatory environment affects average premiums, which affect how many people would find it worthwhile to take advantage of the AHCA’s refundable tax credits, which affects the federal budget. The parliamentarian may not be buying it. But the refundable tax credits, once conservatives’ main source of concern with the AHCA, could offer them a back-door argument to proving that regulatory reform directly affects the budget and thus is allowed in a reconciliation bill. There’s another related reason leaders may not be so keen on eliminating the essential health benefits in this bill, though. It’s a cynical one. The decision to preserve ObamaCare’s coverage restrictions may go a very long way in lowering the cost of providing subsidies under the American Health Care Act. That’s because, realistically, the only way that most low-income shoppers would be able to use their much smaller tax subsidy under the GOP plan would be to buy low-value insurance that isn’t available under ObamaCare and won’t protect them from a real health emergency. In other words: If you loosen regulations, more people might actually find it worthwhile to use the dinky tax credits offered them to purchase dinky insurance, driving up the cost to the federal government. It’s quite the conundrum. Republicans want to deregulate, but they also feel they have to offer some refundable tax credit to sell the bill to moderates and the public. If they deregulate through law, though, the policy analyzers will show that more people might actually use the tax credit and the Congressional Budget Office spending score would blow up. Arizona Rep. Trent Franks, a Freedom Caucus member who wants Senate Republicans to gut the filibuster if that’s what it takes to get their reforms through, told me Tuesday that this is indeed something leadership is worried about. (A leadership aide insisted that Senate reconciliation rules are still the reason they’re not addressing essential health benefits in this bill.) I had been asking him why, according to what he had heard, there was still so much resistance from leaders about doing whatever’s necessary to unlock their votes. If the tax credits were to “get out of control,” it could cause another serious Senate reconciliation problem for the bill: The bill has to be a long-term deficit reducer for it to be permanent. As Franks pointed out, the solution would be to just adjust the tax credits to match lower average premium projections. If leaders were to do that now, though, they’d have a whole new political problem. After the mess we’ve already seen, “House Leaders Slash Subsidies While Eliminating Essential Health Benefit Protections” would not be a helpful headline to sell the bill to the public—or to House moderates.